Malcolm Ater Sr was born in Jacksonville Illinois in 1915. He got a degree from Jacksonville College and took Graduate courses at George Washington University. He was married in 1942 and fathered five children. He served in the Navy as an Ensign during World War Two, and upon discharge, worked briefly for what he later described as the only company packaging commercial comics in New York City. This may have been M.C. Gaines’ Educational Comics. He seems to have figured in that time that he could do the whole job himself, and tried to get a G.I. Business Loan for that purpose but was denied. Undaunted, in July 1946 he set up Malcolm Ater Productions in a ten dollar a month flat at 220 West 42 St in NYC with fifteen hundred dollars that can be assumed to have been savings or loans. His first comic was The History of Gas, 1947, done for the American Gas Association. It introduced the charming Miss Flame, telling the history of gas from its discovery by the Chinese centuries ago. Miss Flame was subsequently used as a gas industry trademark for over 20 years. Script and concept were by Malcolm Ater and art and character design by Jack Sparling. The 1948 Presidential elections were approaching and Ater, a Democrat, approached the Republican party offering to produce comicbooks for them. “I thought that if anybody needed comicbooks – and could afford them – it was the Republicans” , he reflected in 1950. Instead he was rebuffed with the criticism that the idea was ‘too undignified’. Ater took his ideas to the Democratic National Committee via an old friend and ex employer named V. Y. Dallman, who Ater had seen on television during the Democratic Convention in Philadelphia. Ater had taken an overnight train from New York City and presented Dallman with the finished art to The Story of Harry S Truman. Dallman was impressed and took Ater to the Democratic National Committee, who liked the idea well enough to eventually buy three million copies. There were doubtlessly obscure uses of cartoons in local elections, but this was the first use of a comicbook in a state or national election, and Jack Redding, Democratic publicity head asserted that the comicbooks may have strongly influenced the election, particularly in the close states. The book is full sized comic, 16 pages, full color with newsprint covers and known copies exist with both glue and saddle stich binding . It features script by Malcolm Ater and art by Jack Sparling. 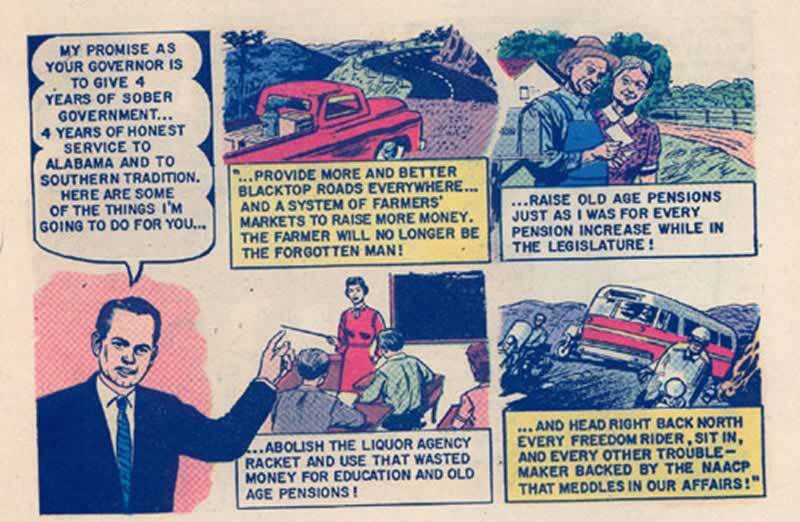 The Republicans would eventually get on the comics bandwagon and produce their own comic for Eisenhower and Nixon during the 1952 presidential election. By 1950 Malcolm Ater Productions was called Commercial Comics Inc., though both names were used through the years, and had offices at 1507 M St NW, Washington DC. By that time they had produced political comics for Senator Scott Lucas (D-Ill, and majority leader of the Senate) Connecticut Governor Chester Bowles and Senator Brien McMahon, Congressman Al Loveland (D – Ia) and Arkansas Governor Sid McMath. They had also produced The Story of Elpido Quirino (for President of the Phillippines) Joe, the Genie of Steel (for U.S. Steel), and America Under Socialism and they were about to make their cultural mark again. Smokey the Bear, a real bear cub orphaned in a forest fire, had been used in a series of ads by the National Forest Service and had proven popular. 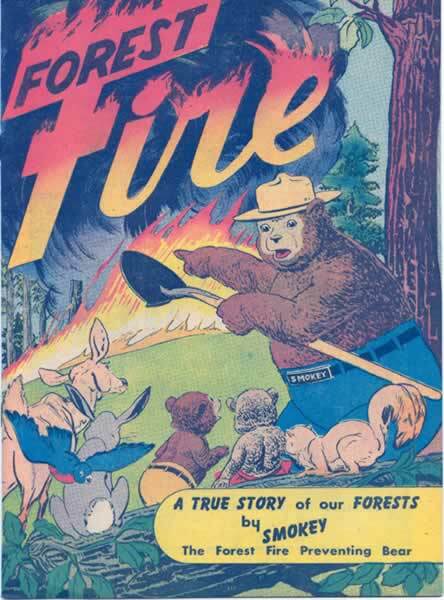 The Forest Service approached Ater about producing a comic and the result was 1950’s Forest Fire. This is a lovely book. The character was created by Rudy Wendelein, and that the art is by Wendelein and Sparling. Mr Wendelien is indeed a skilled cartoonist, with a style that enables him to render the cartoony Smokey and two small bear cubs (in trousers and a dress) next to their realistic animal chums and humans in a seamless manner. This is the first Smokey and predates the Dell series by five years. Smokey the Bear is the longest running advertising campaign in the United States. Ater’s business was taking off. His comicbook promotions had drawn such attention that others had begun producing political books. There was a mini scandal in 1950 when the United Labor League of Ohio commissioned Elliot Caplan to do an anti Robert Taft comic and many thought the work to be libelous (see endnote). Many newspapers and magazines took note of the proliferation of political comics, and Life Magazine reproduced some panels of Ater’s and others’ books in an article that acknowledged Ater as originator of the political comic. Ater’s business continued to grow. During the 1950s he continued to produce political books with a circulation average of 650 or 700,000 and industrial books with an average circulation of one million copies. One of the more interesting from a collector’s standpoint was a government sponsored book on nuclear war, The H-Bomb and You (1955) this was similar to a 1951 color strip that ran on the front page page of the Washington Post in July 1951 titled If An A-Bomb Falls. Also notable was the first Oral Roberts comic. The popular faith healer, one of the first to take advantage of the new medium of television, was so impressed with Ater,s book, Healing For You, that he launched his own imprint,Tele-Pix, which produced 19 issues of Oral Roberts True Stories. In 1943, before Ater’s entrance into the promotional comics field, the industry had produced 20 titles. Print runs totaled 9 million copies generating $250,000 worth of sales. By 1951, 120 books were produced for a combined print run of 100 million copies, generating $2 million in sales, and it was estimated that 1952 sales would top $3 million for 180 million copies of almost 200 titles. Prices for commercial customers were estimated at 2.25 or 2.50 cents a copy for press runs of 500,000. Half of the costs went to printing and paper, 30% for script and art, and the remaining 20% was profit. Ater sold the concept of the books originally, but as his business grew he was usually approached by customers to develop comics. He worked directly with his clients, writing the strips from their biographies or promotional material. Malcolm Ater was a good commercial writer. His dialogue is clear and simple. He organizes information well and has a real grasp of the structure of a comicbook page. He was conscious of the visual appeal of his work and in a 1950 interview spoke of moving away from a traditional comicbook style. After completing the script Ater farmed the artwork out to one of several artists, one of whom was Jack Sparling, a relative by marriage. Malcolm then published the books and delivered them to his clients for distribution. 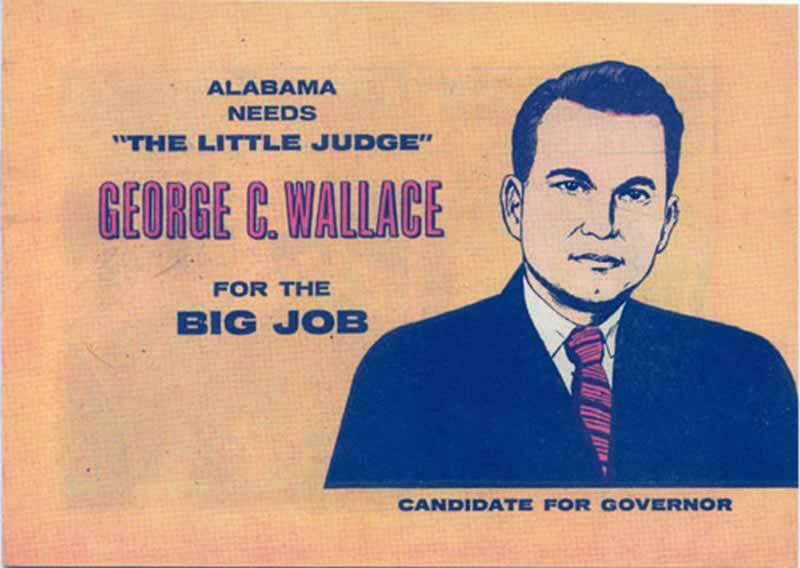 In 1960 Ater traveled to Alabama to meet with George Wallace, who was running for governor. By Malcolm’s retelling, Wallace leaned across his desk and stated “I don’t see how a damn Yankee like you can come down here to Alabama and help me get elected.” Ater replied “Well, Judge, if you’ll recall, I came down here a few years ago and worked for John Patterson and helped defeat you!” Wallace and he became friends and the result was the comic Alabama Needs the Little Judge, George Wallace for the Big Job. This book is pro segragationist and in it Wallace promises to send “back north every freedom rider, sit-in, and every other troublemaker” sent by NAACP. 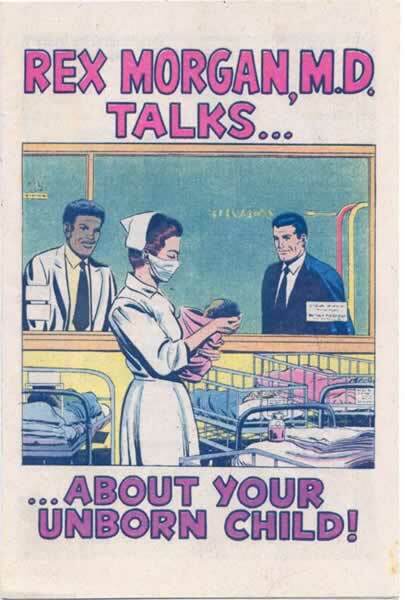 During the 1960s the business continued to grow, and Ater became the commercial agent for Publishers Hall Syndicate and was working with their well known characters such as Dennis the Menace, Mark Trail, BC, Andy Capp and Rex Morgan, MD. Under this contract, Ater produced the popular Dennis the Menace Takes a Poke at Poison (1961, with a completely redone second version in 1981), and eventually twenty million copies were printed. This was a very influential book, and Ater was told by the Department of Agriculture, which had commissioned it, that they believed it to have been an extremely valuable educational tool. During this time Publishers Hall approached him with a plan to put $250,000 into his business and put their salesmen out on the road to promote his product, but Ater declined, preferring to keep control of his business. “I don’t want to become a millionaire” he said. During the 1960’s the purely political work became less popular and the bulk of his work became more informational and funded by the federal government. This trend continued into the 1970s with the production of books such as Think First of Your Unborn Child (Rex Morgan, MD introduces foetal alcohol syndrome), It”s Best to Know….About Alcohol, Teenage Booby Trap and What if They Call Me Chicken (both anti drug). There were numerous cancer awareness books for the National Cancer Society and even the mischievous Dennis the Menace turned ‘relevant’ for the National Center on Child Abuse and Neglect’s Dennis the Menace Coping with Family stress. This change in content and funding was fine with Ater as he’d come to see politicians as hypocrites, though he still enjoyed the friendship of George Wallace, who by this time had pragmatically and honestly recanted his racist views and was seen by Ater and many others as a straight shooting realist. During the 1970s Ater produced The President’s House, a slick magazine given away to White House visitors during the Ford and Carter Administrations. This was the only venture into non comics publishing He did, and it was similar to his 1956 comicbook Visiting Washington, which was handed out as a travel guide by congressmen and senators to visiting constituents. 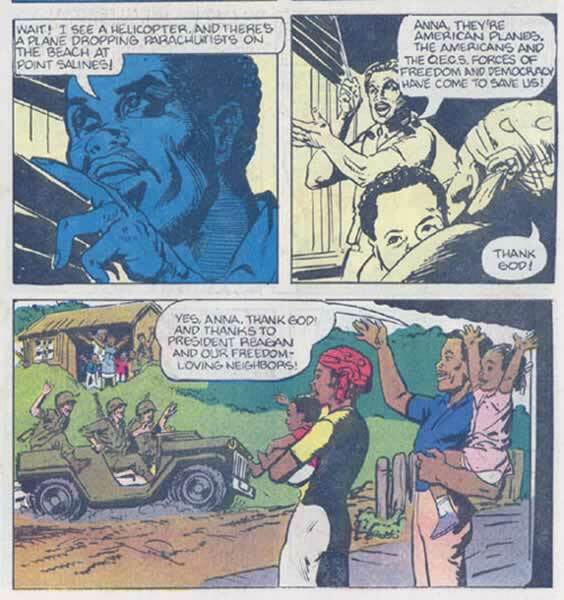 During the 1980s he continued to produce comics, one of which was commissioned by the Central Intelligence Agency to be air dropped over the island of Grenada during America’s 1983 invasion of that country. The CIA had to distance itself from the project and neither their name nor that of Commercial Comics appears on the book. When Ater was to pick up a check for production costs he was told by his CIA contact to meet at a pre arranged place in Washington DC. Ater the meeting he and the agent got into a taxi where he was given a suitcase filled with $35,000 cash. Also during this time he produced the comic Madonna on Aids, which was commissioned by the rock star and given away at concerts. Malcolm Ater published comics until his death on 10 May 1992. He was remembered as a dignified man of high standards, who thought it awful, as many of his generation did, when his children started wearing jeans in the 1960s, but he was also remembered as someone who was equally at ease hosting a formal party of politicians or a cook out for professional baseball players. He should also be recorded as the man who created the political comicbook, the first Smokey the Bear comic and one of the most reproduced comics ever. In a 40 year period Malcolm Ater wrote and produced almost 80 comicbooks that propagandized and informed, and may well have influenced the course of democracy in the United States. Robert Alphonso Taft (1889 – 1953) was the son of William Howard Taft, the 27th president. Elected to the US Senate in 1938 after serving in the Ohio legislature, he was reelected in 1944 and was known as Mr Republican because of his influence as a policymaker. He was the co-author of the Taft Hartley Act, a continuation of the National Labor Relations Act, which limits the rights of organized labor to strike if the public health is involved, bans closed shops, secondary strikes and featherbedding. He had been a strong contender for presidential nomination in 1940 and 1948. In 1950 he was up for re election, and The United Labor League of Ohio hired cartoonist Elliot Caplin to do an anti Taft comicbook. The simplistic stereotype of J. Phinneas Moneybags and his cohorts plotting to keep Taft in office was offensive to many, and the book was described as libelous and a piece of character assignation. On 31 August 1950 The New York Times noted that several persons had distributed the comic during one of Taft’s speaking engagements. Taft supporters destroyed several copies on the spot, throwing the pieces back to the demonstrators, and Taft mentioned the incident in a speech, declaring that the democrats were resorting to lies and misrepresentations to keep him from reelection. Taft was reelected in 1950 and in 1952 was the leading Republican contender against Eisenhower for the Republican presidential nomination. Where There’s Smoke (American Cancer Society, 1963.) there were 24 press runs for a total of 15,300,000 copies. Early runs had back cover ads of non smoking athletes, including Bobby Richardson, Bill Russel. Athletes were changed in 1972, and none at all in last press runs. The H Bomb and You (U S Government, 1955) 20 pages. Rare, low distribution in a few cities. Average print runs of industrial comics were 1,000,000 copies. Unnamed, undated reference: Assorted Smiles, newspaper column by V.Y.Dallman (Admiral). 1950?